Tensions are high between the White House and Congress following Tuesday's elections, but the Obama administration is confident it's found one area where Democrats and Republicans can still work together: fighting Ebola. In a huge scale-up in funding requests, the administration is asking Congress for $6.18 billion in emergency funding for the federal government's Ebola response efforts. And administration officials remain optimistic that a deal will be worked out—fast. "It's clear to us thus far that this is being taken seriously as an emergency," said Office of Management and Budget Director Shaun Donovan on Thursday. "We've been pleased so far with the engagement seen on both sides of the aisle." The federal government has already spent $400 million on the Ebola response, and it has committed more than $1 billion. Donovan points to the inclusion of Ebola money in the continuing resolution passed in September as a good sign for a bipartisan agreement on the new funding package during the lame-duck session. The administration is open to whatever vehicle makes sense, he said, but the funding would most likely be included as part of the omnibus bill on Dec. 11. "The most important part is speed," said Donovan. "This should be emergency funding, because this is an emergency. It's critical that this funding is quick and at a level appropriate to the scale of the epidemic." The administration's ask includes $4.64 billion for immediate response and $1.54 billion in contingency funding. The immediate response has four main areas of focus: enhancing domestic health programs—from state, local, and hospital preparedness and training, to monitoring and contact tracing; ending the epidemic in West Africa; accelerating the development of vaccines and therapeutics; and strengthening global health security by bolstering health infrastructure in developing countries to prevent these kinds of outbreaks in the future. The Health and Human Services Department is requesting the most: $2.43 billion. 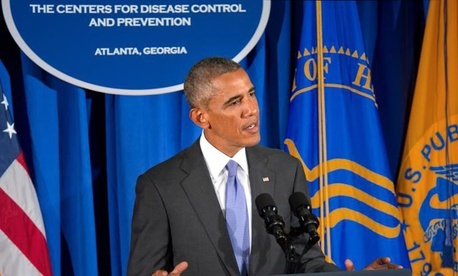 The majority—$1.83 billion—would go to the Centers for Disease Control and Prevention. Another $333 million is for the Public Health and Social Services Emergency Fund, $238 million is for the National Institutes of Health, and $25 million is for the Food and Drug Administration. The remainder would go to three agencies: $1.98 billion for USAID, $127 million for the State Department, and $112 million for the Defense Department. Administration officials emphasize the need for flexibility in the Ebola response, and they say the contingency funding would allow the government to scale up efforts depending on how the epidemic evolves. This could include increased monitoring of returning health care workers, enhanced vaccine production, or expanded aid in affected West African countries. But most important, the White House reiterates, is speed, which is reflected in the prioritization of funds. "What's extremely important is making sure we have a response on the ground right now, today," HHS Secretary Sylvia Mathews Burwell said Thursday. Immediate funding for agencies like the FDA is lower because the timetable for the development of diagnostics and vaccines is longer than other efforts to fight the outbreak, she said. "We're scaling up the response as quickly as we possibly can," Donovan said. "The risk, if this is not passed by mid-December, is that we could start to see funding gaps that could set us behind in the effort." The Senate Appropriations Committee will hold a hearing on the government's Ebola response Wednesday, with Burwell and other administrations officials scheduled to testify. This article appears in the November 7, 2014 edition of NJ Daily.